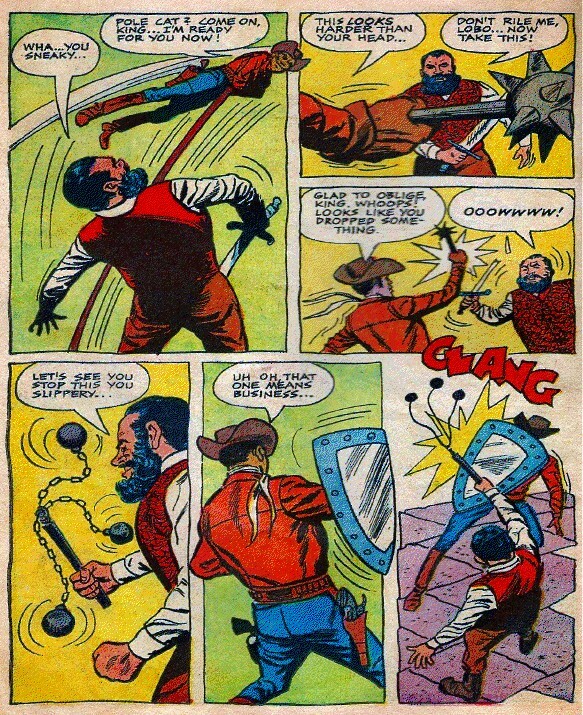 African American comic books have often met resistance, especially in the earliest days of the genre. 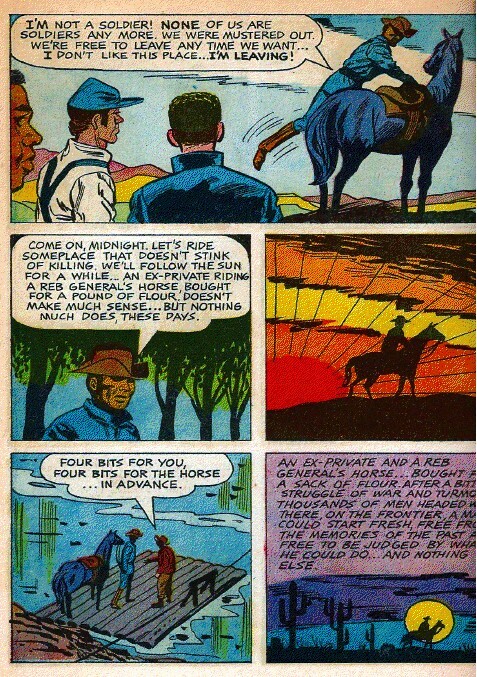 When Dell comics tried to publish a Wild West tale in the same mold as the Lone Ranger with a dash of Batman they must have known the going would be rocky, especially with the mostly white drugstore owners that would be selling their books, but they could not have foreseen that issue two of this very short lived comic book would be sent back to them, with most of them still bound in their original shipping twine, never opened. Issue one begins with the end of the Civil War. Lobo is a solider being mustered out the Union Army. After being attacked by a small band of confederate soldiers whom his compatriots shoot down Lobo smashes his rifle against a tree and leaves for the west hoping to leave the world of violence behind for the life of a cowboy. He soon finds that life as a cowboy means always proving himself to his white colleagues. Though he is tolerant and forgiving of the unfair treatment he defends himself and remains dignified, often humbling those who would humble him. Unfortunately two of the cowboys that he had to humble accuse him of robbing and murdering the paymaster of their cattle drive, the real murderer is another cowpoke by the name of Johnson,. 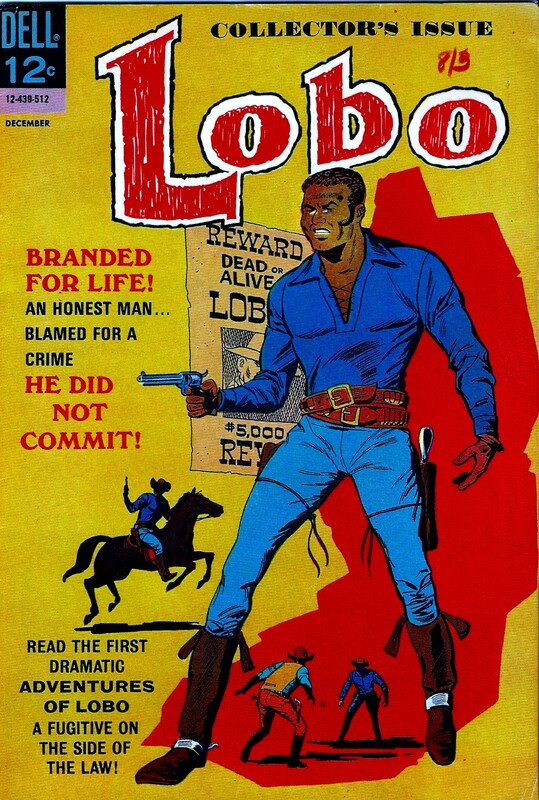 As Lobo goes on the run hoping to prove his innocence he meets a prospector who is drowning in a river. It is revealed that the prospector was also accused of a crime he did not commit and the two form a bond. The prospector offers Lobo his fortune to fund his quest to prove himself innocent, but he refuses, but he does take a pouch full of gold coins with the engraving of a wolf and the letter L, a coin that would become his trademark. The two cowboys who accused him of the crime along with an accomplice of theirs rob a local bank and Lobo apprehends them and turns them into a sheriff who declines to arrest lobo after getting one of the Lobo coins saying “I don’t know there was just something about him…” Later he finds Johnson staked in the sun, punishment by a group of Apaches whose horse he had tried to steal. Johnson dies and along with him Lobo’s only chance at proving his innocents. He decides to ride back and visit the old miner who made his coins only to find him dying. The miner asks Lobo to take his fortune in gold and do some good with it, which is what he decides to do in the closing pages of Issue 1. In Issue 2 Lobo finds a man tied in the back of a wagon heading for bottomless canyon. After saving him it is revealed that he is a local farmer who is being bullied off his land by “the King of the West”, a local cattle owner with delusions of making a new Camelot out of the west with himself as King Arthur. Lobo decides to help and tries to round up a resistance but finds the locals reluctant to cross the King. Lobo rigs a flash bomb out of a bag of flour and some black powder and apprehends some of the Kings men. The King decides to tarnish Lobo’s reputation by making some duplicate Lobo coins and leaving them at various crime scenes. The trick is soon uncovered when the coins are revealed to be lead with a thin sheen of gold on the outside. Lobo rides to the Kings castle for a final showdown. 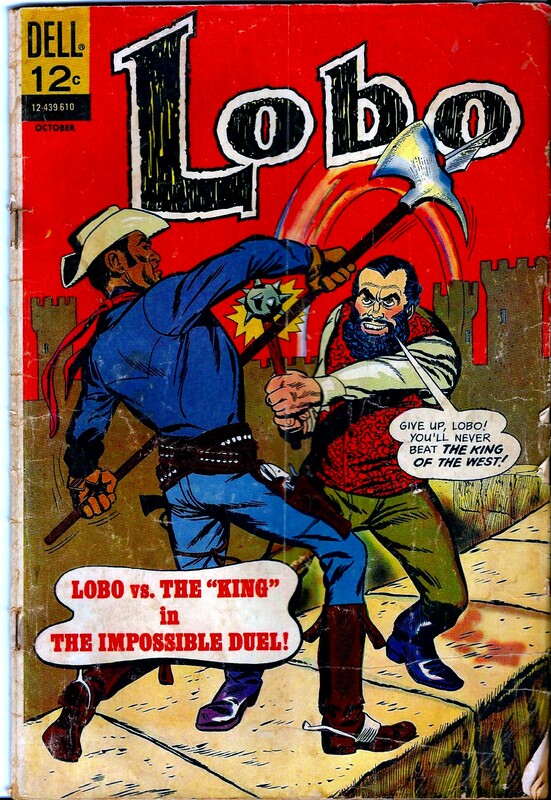 The King asks Lobo to choose from his impressive collection of Anachronistic weapons from the Middle Ages. The two men fight with spears, maces and crossbows, but when the tide turns against him the King calls in his cronies. Lobo makes his escape along with a girl the King had been holding. They meet up with the Sheriff and when the girl reveals to the sheriff that the King had been holding her hostage the King shoots her, wounding but not killing her. Lobo chases him down and the King, in haste to escape falls into quick sand. Lobo saves the ungrateful King who still tries to kill Lobo, but Lobo knocks him out and hands him over to the sheriff who lets Lobo go even though he is still technically a wanted fugitive. Unfortunately that was Lobo’s last ride. Dell comics received most of the first and almost all of the second issue back in opened packages. Drugstore owners were reluctant to sell a comic book featuring and African America superhero. Tony Tallarico, one of the co-creators was honored in 2006 at a dinner at the African American Museum in Philadelphia for helping create the first African American to star in his own comic book. It would be years until Marvel would decide to try and enter the urban market with an African American staring in his own title. Luke Cage would unseat Lobo as the first African American superhero with his own ongoing title that went for more than two issues, but Lobo blazed the trail. Very cool. Luckily he’s now in the public domain so he could always ride again!